To aid in the fight against America’s childhood hunger epidemic, Einstein Bros. ® Bagels has joined forces with No Kid Hungry. 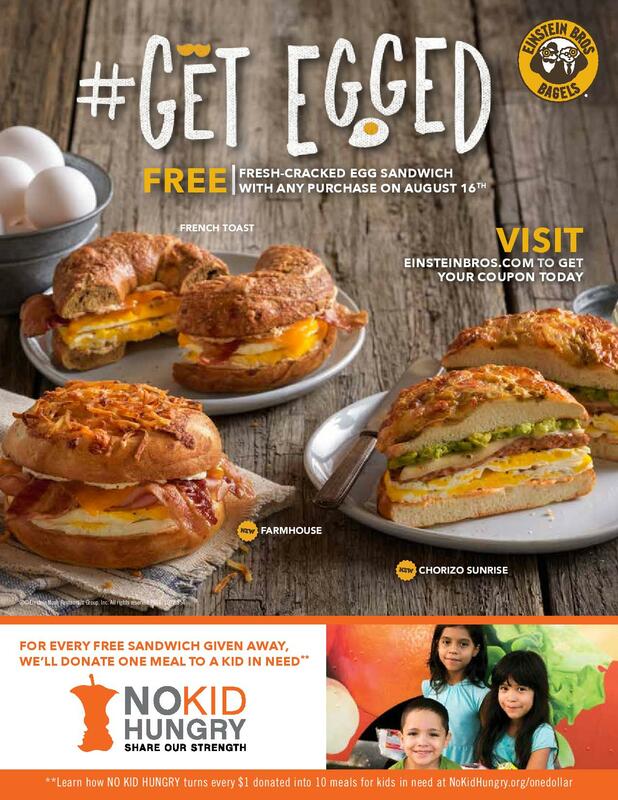 To kick off the partnership, on Tuesday, Aug. 16, Einstein’s will offer its customers a FREE all new, fresh cracked egg sandwich and for each sandwich given, Einstein’s will donate a meal to a child in need. Those interested in showing their support and trying one of the new gourmet sandwiches can download their free coupon at einsteinbros.com then visit any of the participating Einstein Bros. Bagels U.S. locations to enjoy a free egg sandwich with purchase. To learn more about No Kid Hungry visit NoKidHungry.org/onedollar or join the conversation on social media using the hashtags #GetEgged and #NoKidHungry.